Architectural storytelling has always been one of the strengths of Masquespacio, the creative consultancy of Ana Milena Hernández Palacios and Christophe Penasse. 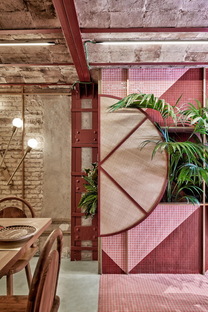 Kaikaya, a tropical sushi restaurant in Valencia, is the fusion of two cultures in a single, open, welcoming space with a really eye-catching design. When you decide to dine out and you're trying to choose where you want to eat, you think about what the food is like, first and foremost. But the ambience, the interior design and the general feel of the place are just as important. Anyone who goes to the Kaikaya in Valencia, the latest creation by the multi award-winning creative consultancy, Masquespacio can rest assured that you'll get both fine food and unique visual storytelling that expresses the philosophy that drives the restaurant's owner. To tell the truth, this is actually the first tropical sushi restaurant in Valencia, inspired by the owner's lifestyle and mixing elements from Japan with the Brazilian tropical style. So, let's go back a bit to explain this approach. In the early 20th century, the first Japanese migrated to Brazil with the idea of working in the coffee plantations. Japanese cuisine was completely different from Brazilian food, so the Japanese were forced to adapt and use the ingredients they had available to them locally. In the search for their flavours, a new Japanese-Brazilian fusion cuisine emerged, which very quickly developed its own strong identity. 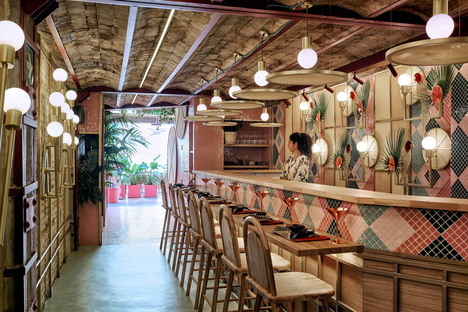 And here in Kaikaya, you will find the same fusion of traditional and methodical Japan with tropical, exotic and contemporary Brazil in both the menu and the interior design. 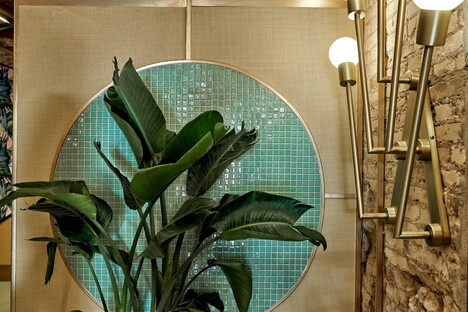 The team from Masquespacio based their design on the existing architectural elements like vaults, steel beams and original brickwork, highlighting the beauty of the imperfections left by time. Ana Milena Hernández Palacios and Christophe Penasse didn't want to fall into the trap of the respective stereotypes of the two countries, so they went for a combination of materials reminiscent of Japan, like timber and raffia, and added some 1970s, bright and cheery tropical-style elements from Brazil, with colourful patterns made of mosaic tiles, parrot and palm leaf motifs in the bespoke lights designed by Masquespacio for Kaikaya , and an abundant use of tropical plants. These plants are everywhere - poking out of all the nooks and crannies carved into the walls, along the stairs, spilling over the balcony - creating a really exotic ambience, just like the food that is served here. 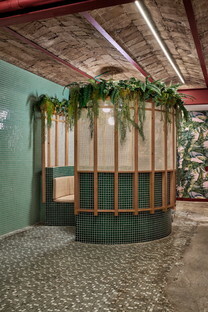 With the Kaikaya restaurant in Valencia, Masquespacio once again demonstrates that to create fine venues you have to know how to be a great storyteller, filling in all the details and focusing directly on the choice of decorative elements in a creative fusion that transcends all the conventional stereotypes.